Geoff was a collegiate wrestler for years and is now the Wrestling Coach at SBGi Berkeley in California. 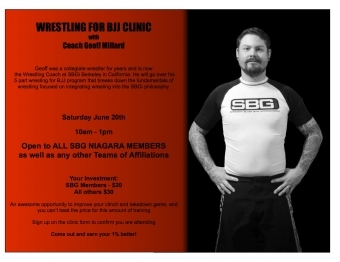 He will go over his 5 part wresting for BJJ program that breaks down the fundamentals of wrestling focused on integrating wresting into the SBGi philosophy. An awesome opportunity to improve your clinch and takedown game, and you can’t beat the price for this amount of training. Contact Coach Rich to confirm your attendance. Come out and earn your 1% better!